When I first started teaching over 16 years ago I thought that each year would be easier. I figured the first few years were about creating activities for your classroom and lesson planning and then after that you would just tweak slightly the lessons and that would give you more free time. Boy was I wrong. I find I spend just as much time, if not more working on lessons and activities. Yes I could have followed my beginning plan and just do the same thing year after year. That would make my life easier, however, I would be doing my students a disservice and I would not be growing as a teacher. Things are different now than they were 5 years ago, 10 years ago, and even 15 years ago. When I started teaching there were no standards. We had certain topics that every teacher had to teach but we were free to decide how long we would spend on those topics, how deep we would go with those topics, and how we would teach those topics. I loved having the freedom to have my students really get into their projects. I had weeks to have my students understand and work with the scientific method. They created their own board games, tested them, surveyed them, improved them, and they loved doing every part of it. They researched how they could build a colony on mars and had to account for getting their. The projects took weeks but the students were engaged, they were problem solving, and most importantly they loved learning. Then came the state science standards. Although I understood their importance to make sure all students had equality in their learning I found the challenge of making sure the students learned all the standards to be daunting. The number of standards the students had to learn, in the time frame they were given to learn them, and at the level of understanding they had to achieve was an almost impossible task. The wonderful projects that I used to do were cut due to time constraints. I found that after years of these standards the love and passion for learning was going away. The creativity I once saw was almost gone. Students stopped thinking and using their imagination. They became robots just sitting their wanting the be given the information and answers knowing that it was their job just to memorize it and recite it at test time. Something had to be done. Last year I was introduced to a concept called google 20% time otherwise known as genius hours. Students are able to research and work on a project / topic of their choice. It is a way to bring passion and the love of learning back into the classroom. I decided that this is what my students were missing. I did a lot of research on the topic. I read about how to introduce it to your students from different blogs (see below for links), I read the book Drive by Daniel H. Pink, I watched youtube videos about it, and I read through the many posts about it on twitter #geniushour. I was so excited and nervous and terrified to introduce it to my 8th grade Pre-AP science class. Any time us teachers take on a new challenge like this I think we feel that way. 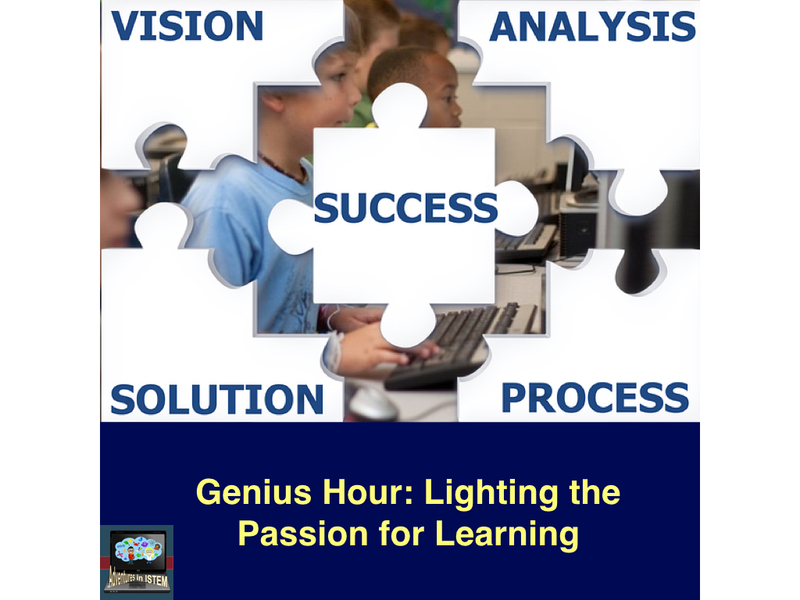 I have it set up so that every Wednesday, our shortened collaborations days, the students get to work on their genius hour project. Here is a brief overview of how I introduced it. - Week 1: I introduced the project with a short video about what genius hour is and then I had them watch the Pep talk video by Kid President. I then explained what they would be doing every Wednesday and what the end result should be. To help them think of a topic and guiding question we then did the Bad Idea factory to come up with some really bad ideas. These bad ideas helped focus the students and got them thinking. - Week 2: My students filled out a google form that included what their topic was about, their guiding question, what they plan on doing for genius hour, and how their were going to present their information to the world. I then allowed them to start doing some basic research on the topic. - Week 3: The students created their own google sites where they could give a basic idea of their topic, write about what they already know about it, and record the information they were learning and links to the websites they found useful. I originally wanted them to blog about what they were doing each week, however my district has blocked blogger and kid blog is now a paid service. My students then posted a link to their websites on our class padlet page so that anyone in my Pre-AP science class can view what they were doing. - Week 4: This was the first week that my students had the whole time to really research their topic. You could see the excitement on their faces as they were learning new information on a topic they were interested in. I kept getting called over so they could share their excitement on what they just discovered. Their homework that night was to post on their website a reflection of what they did, what they learned, and new questions they had. A few days later their homework was to read the posts of their group members and then comment on it. This proved difficult since we discovered you could only comment on the whole site and not an individual post. - Week 5: Together my students and I reflected on how it was going so far. I explained my ideas for their posts and how I thought it was going with the ability to reflect and comment on the individual posts and as a class we decided that writing the weekly reflections on schoology as a discussion post would be better so that everyone could get an idea of what different students were learning about. 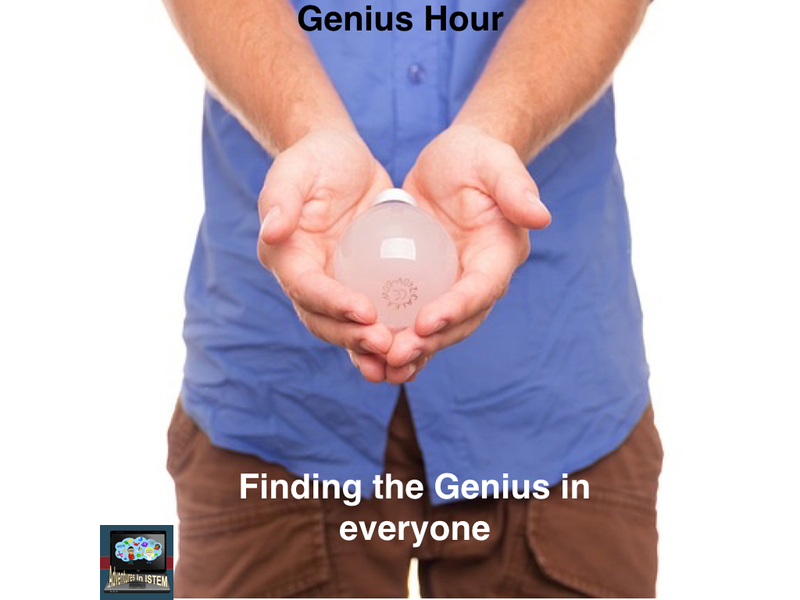 Originally my idea was that every quarter would be a new topic but with the first quarter ending in two weeks I have changed how we are going to do genius hour. Instead my students are going to present to the class on the last Wednesday of the quarter what their topic is about, why they chose that topic, and what they have done so far. I am going to use it as a check point for their journey. Although I have faced some hiccups along the way I love seeing my students excited to learn. It has helped bring the love of learning back into the classroom. If you have done genius hour I would love to hear some suggestions about what I can do to improve it.